Henry Arnold was Commander of the United States Army Air Forces in World War II, and the only air commander ever to attain the five-star rank of general of the armies. Arnold was especially interested in the development of sophisticated aerospace technology to give America an edge in air superiority, and consequently helped foster the development of such innovations as jet aircraft, rocketry, rocket-assisted takeoff, and supersonic flight. 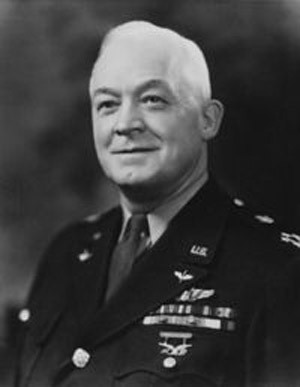 After a lengthy career as an Army aviator and commander spanning the two world wars, he retired from active service in 1945 but continued to urge that the United States should develop a postwar deterrent force that included long-range ballistic missiles, developed from the V-2, rather than short-range guided missiles. 1. Arnold, Henry H. Global Mission. New York: Harper & Brothers, 1949. 2. Coffey, Thomas M. Hap: The Story of the U.S. Air Force and the Man Who Built It. New York: Viking, 1982. 3. DuPre, Flint O. Hap Arnold: Architect of American Air Power. New York: Macmillan, 1972.